I found this scone recipe while perusing Food TV Magazine, and in an attempt to avoid housework, I went straight to the kitchen to make a batch. Somewhere along the way I realized a) I had no business making scones at that moment and b) we didn’t have any butter. So I finished mixing the dry ingredients and stuck them in the freezer. This morning, butter supply replenished, I finally assembled the Maple Oat Scones. I guess all the “making ahead” and “halving” distracted me from just how much butter was actually in the recipe, and it wasn’t until the scones were in the oven and I’d had a cup of coffee that I realized each scone had more fat than your average glazed doughnut. Rather than feel guilty for serving something so unhealthy for breakfast or feel guilty about throwing the whole batch out, I halved the scones with a knife and served them in small portions. They are ethereally light textured from all the butter, and the butter flavor is wonderful with the maple. I’m not sure I’d make these again for breakfast, but they are delicious and I might make them as a special treat or for an event. Here’s a link to CI’s. This is a good one. Hi Anna, I get that magazine too( 3yrs for 10 bucks, whoo hooo). I almost died when I saw the recipe had 1lb of butter. What? 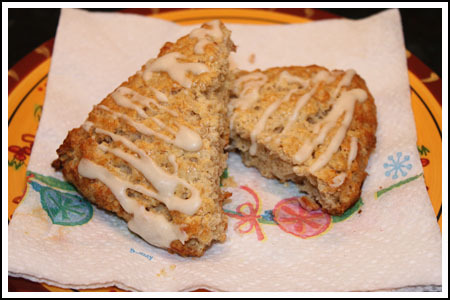 I love CI’s oatmeal maple scones, but can’t remember how much butter those have. Those might be a good alternative for you. I love Ina – she makes no pretenses about her recipes being healthy. She owned a gourmet take-out shop in the Hamptons & rich baked goods were their trademark. Her rugelach are the best I’ve ever had. Anna, your plan to cut the scones smaller is the perfect way to enjoy little special treats. All things in moderation. I saw these as well in my Food Network magazine. Not to take away from the topic of the scones, but I love my FNM. Anna or others, have you seen any other magazine that you like better than FNM pertaining to food related items? Not suprising that you found the recipe too rich, that tends to be an Ina Garten trademark. I made another one of her scone recipes (Cranberry?) and not only was it too rich, but much too sweet. I made one of Ina Garten’s scone recipes and it was waaay too rich. They were really good, and definitely not too sweet even with the icing. There is a lot of butter, but Cooks Illustrated uses the same ratio of butter to flour in some of their recipes. I love maple! These look delicious! maple scones are my favorite scones of all (and pumpkin). BUT I have never added oats to them. yeah if I ate these for breakfast I’d be ready for a sugar-nap in two hours. but these are great for dessert with a side of whipped cream for dipping. Yum. I always love making scones. I find them to be so comforting and a little bit more special than muffins. This looks like a great version. Anna–like @justJENN, when I was in graduate school in my 20s, my favorite breakfast was a maple oat nut scone at Starbucks. I always estimated the calories as around 400, and I believe the scone clocks in at around 450, according to the website’s nutritional information. Is this a copycat? 450 calories for breakfast, depending on how it balances out with your other meals, actually isn’t that bad. I don’t have premium cable, so I’ve never seen Ina, only her recipes online, and they do tend to be rather decadent, though. Coming up with a slimmed-down maple oat nut scone would be an interesting challenge. Oh, I used to like the ones at Starbucks!